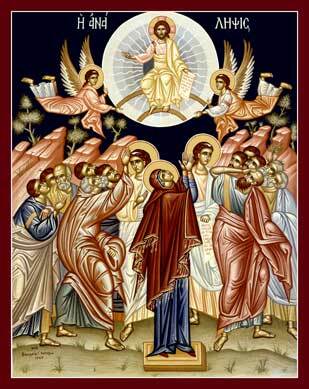 The Ascension icon shows Christ, with angels, being escorted back to His heavenly home. His Mother Mary stands with angels and the faithful disciples. This icon is usually displayed for veneration, in the center on the church, on the feast of Ascension. The icon is divided into two parts, top and bottom, heaven and earth. The top is in order, the bottom, except for the Theotokos, is in confusion. The figures are set against the hilly landscape of the Mount of Olives, scattered with olive trees. It is painted with bright colors as a joyous icon. Although the icon depicts the event described by Saint Luke, it is not meant to be a historical picture, but a representation of the Church. Christ is shown inside the mandorla blessing all with his right hand and holding a scroll in his left. This is to show love and knowledge. This sphere is being carried up in glory by angels. Even though we see Christ departing, the Orthodox Church sees the second and glorious coming in the same icon. Jesus said he would return exactly as he ascended. The icon does not show direction. His love and teachings are still with the Church. The focus of the lower part of the icon is the Theotokos. She represents the entire Church waiting for Jesus' return. The entire group, the Theotokos and the disciples also represent the Church. In this case the faithful learning Christians. The disciples are waiting for the descent of the Holy Spirit at Pentecost and are shown in confusion. The disciples shown can not be the historical gathering, but again a image of the Church. The Apostle Paul who was still Saul, a nonbeliever at that time, is standing next to Mary. Then two angels in white clothes said to the disciples, "Ye men of Galilee, why stand ye gazing up into heaven? This same Jesus, which is taken up from you into heaven, shall so come in like manner as ye have seen Him go into heaven." Then the disciples returned to Jerusalem (Acts 1:11). This page was last edited on May 8, 2013, at 14:12.